The Chivas Regal Party at Cafe Football is an exclusive event where you can stand a chance to win from the Grand Draw - a pair of VIP tickets to catch Man Utd vs Liverpool live in action, 2 return flight tickets, a 5-star hotel accommodation, and exclusive Chivas dinner. 2. For purchases done directly in Cafe Football Singapore > Fill in the form given to you & you’ll automatically be included in the Grand Draw. For purchases done online > Fill up the e-form to be part of the Grand Draw. 3. Invitation* for two to the Chivas Regal Party will be sent to you. *Limited to FIRST 100 entries only. The Chivas Regal Party at Cafe Football is an exclusive event hosted by Cafe Football in collaboration with Chivas Regal. Be entertained with games and live DJ while partying with Chivas Sonic through the night. 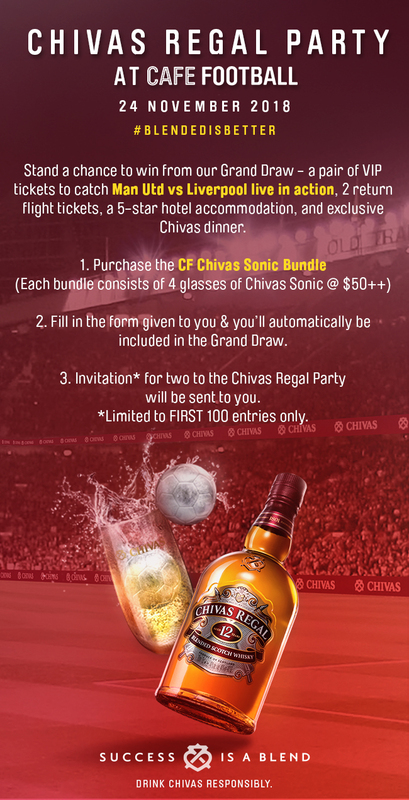 Aside from complimentary glasses of Chivas Sonic, there are lots of prizes to be won - a party not to be missed! Purchase a bottle of Chivas 12 from Cafe Football Singapore to earn more chances in our Grand Draw (4 chances and an invitation for a party of 4)! *Purchased bundle has to be redeemed at Cafe Football Singapore before 24 November 2018. Any unredeemed bundle will be forfeited. *Winner has to be present on 24 November during the Grand Draw. Make your event stand out, host it at Cafe Football! Thank you for your order, we will be in touch with you shortly with the payment details!